History of the Springs and Wells movement in the Malvern Hills, Part 4. 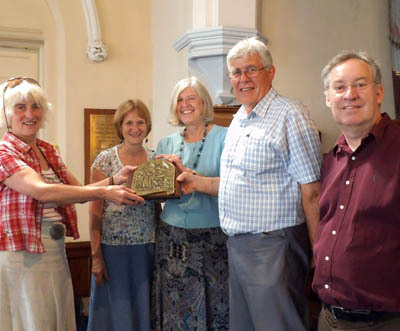 In the picture right, Cora presents the St Werstan Founders Prize for Well Decorating in 2014 to the Holy Trinity team. Following the closure of the Malvern Water Bottling Works at Colwall and the difficult publicity and circumstances that led to it, some debate ensured as to how the site should be reused. The Tank House was by now a listed building and the developers wanted substantial housing and a care home for the elderly together with a retail general stores. Unsuccessful efforts by some to reintroduce bottling came to nothing and eventually planning permission was granted for houses, care home and shop. Demolition and new building works ensured. After their bitter public relations disaster with Malvern bottled water detailed in the Third Septennial text, the Malvern Spa Association subsequently took a low profile stance with several officers leaving the district. Fortunately those involved in the annual Well Decorating remained active and this was perpetuated as an annual event. Meanwhile, the Friends of Malvern Springs and Wells continued to go from strength to strength. Following the closure of Colwall Malvern Water bottling plant, the Stone Bottle Fountain was relocated to the Three Counties Showground as a tribute to the 160 years of bottling Schweppes Malvern Water. Here it was placed in a purpose built ornamental garden and unveiled by the Bishop of Worcester. Throughout, the bi-monthly Friends of Malvern Springs and Wells newsletter continued to promote the latest information on Malvern Springs and Wells. In particular one set of circumstances featured in the newsletters that caused concern during the winter of 2014/5 was the contamination of springs. Although a natural phenomena, testing by Worcestershire Regulatory Services identified contamination of most sites where the public had access to spring water. This resulted in adverse widespread publicity and posting of notices on individual sites. Such contamination was likely caused by the end of summer rains causing surface water to enter the springs together with whatever it washes in along its course. A web site was proposed but this had obvious problems; keeping it hourly updated and the fact that occasional testing related to a spring at that moment in time, It could prove to be clear on testing but contaminated by the next shower. No solution was found to the dilemma and users continued to utilise the waters as had been the case for centuries previous. Another activity that attracted wide attention was the reinstatement of the G B Shaw Mulberry Tree in Priory Park by Friends. The cuttings had been secured from Australia and were being reared at secret locations. Eventually two trees were planted in Priory Park early in 2014 and a date set of 2016 for a formal unveiling and the placing of a plaque recording the background to this project. Di Foster from Malvern Australia visited the Park to check out what her earlier efforts on the other side of the world had resulted in. Occasional newsletter updates enabled all to keep abreast of progress. This project was sponsored through Coca-Cola and would not have been viable without their financial support. This company will as a result leave a lasting positive memory in Malvern in spite of their efforts at perpetuating the bottling works at Colwall being thwarted with adverse publicity. In the summer of 2014 the Owls Hole pump and engine reappeared when taken over by local engine enthusiast John Clifford. It was first rescued in the 1990s. In 2014 this vintage well pump and power plant soon re-appeared at events at the Three Counties Showground, chugging away for several hours each day. For some years a mysterious brick arch in Rosebank Gardens had perplexed Friends. Following investigations by Brian Illes, a spring/well was discovered and transformed into a garden feature. Other new discoveries in 2014 included a Dropping Well in Madresfield Court grounds. Also in the grounds of Ellerslie in the Wells Road, a former pupil of the school there alerted Friends to a previously unknown water feature in the grounds. It quickly became known as Joanna's Well, named after the informant. After lobbying by Friends, the feature is to be retained by developers who are building a rest home for the elderly on the site. Then in 2015 David Furlong rediscovered the Myrtles Spring on land in Como Road. Previously the site of a hotel, the land was denuded of all structures pending development and the source of the original spring piped underground. David reopened the pipe and created a new water garden in the grounds of his house adjacent to the site. The continual involvement of the public in this way resulted in new sites being recognised. This was encouraged through the St Werstan Awards scheme and the Friends newsletters which often prompted major newspaper coverage. With the demise of Colwall bottling plant it was pleasing to learn that the tradition of bottling Malvern Water was perpetuated at the Holy Well. The Humm family not only restored the building but continued to market Malvern Water in smart green bottles. In 2015 Well Decorating took place again as a regular annual event. This year the Founders Prize went to St James School. As 2015 drew to a close the Lodge Fountain restoration proceeded. This highlighted the problem of funding urgent restoration needs. In the case of the Lodge Fountain, the Civic Society had been approached for funding. Agreeing in principal they then sought to stipulate a number of totally inept conditions resulting in major delays in furthering the project. These were unacceptable and fortunately a private donor came to the rescue. What was perhaps needed was a continual fund to be maintained for such purposes. The question as to how to raise the monies however still awaited resolution in 2015. The year 2015 closed with some tragic news. David Habershon, who had been responsible for the modernisation and restoration of the Tudor Hotel building in Great Malvern, passed away. He was a former chairman of High Street Malvern and a great Friend of Malvern Springs and Wells. The new Mulberry Tree together with a plaque in Priory Park, near the site of the original which blew down in a storm in the year 2000, was unveiled by Di Foster from Malvern, Melbourne. A series of associated events planned for the day ended with an evening of food and general celebration at the Mount Pleasant Hotel. Di with the tree and plaque is pictured left. This event in the summer of 2016 also prompted interest in the many Malverns around the world and was the seed of the project that became known as Malverns Worldwide. The project was in due course to have significant ramifications across the globe. Other events in 2016 included the findings of research into the demise of the West Malvern Spa building. This was apparently due to a structural defect that resulted in the beams supporting the floors and roof rotting. Also Marienbad in the Czech Republic aroused interest. Here the Singing Fountain was explored to see if such a creation had potential in Malvern, England. This trip coincided with the Malvern Civic Society twinning with Marienbad. By October 2016 the Malverns Worldwide project was formulated and the tracking down and contact with Malverns across the globe ensued. This project aimed to extend the hand of friendship to all who were associated with the many Malverns world-wide. Their history invariably tracked back to Great Malvern in England where the Malvern religious establishment and community was created at the time of Edward the Confessor, just before the Norman Conquest. The story of the creation of the original Malvern was translated from the medieval stained glass windows in the Malvern Priory. Significantly a visit by envoys Cora and Bruce to Malvern, New York resulted in the establishment of 19th October as Malvern Appreciation Day; a celebration that has been continued ever since. Early in 2017, Cora and Bruce celebrated their 25th anniversary of working on the springs and wells and more recently Malverns Worldwide. Over that time they had published extensively on the water sources of the Malvern Hills having researched and categorised over 130 sites of specific interest. Their latest investigation was the earlier gold mining on the Malvern Hills which had possible relevance to the development of Malvern, Johannesburg in South Africa, now a major gold producer. The year 2017 saw other events that promoted Malverns including a visit to Malvern, Pennsylvania. Here a formal greeting by the mayor and the local senator cemented a relationship that was to perpetuate for many years. 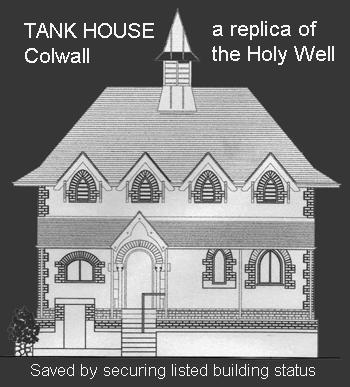 It was also pleasing to record that the Tank House in Colwall, once on the site of the Malvern Water bottling works, had survived as the central focus of a modern housing estate. The efforts at getting the building listed as a significant historic edifice had resulted in a forward plan that gave it prominence in a modern context. As the year progressed Barbados was welcomed into the Malverns Worldwide project with the Malvern House and plantation. The state flag of Malvern Pennsylvania was also flown from the Great Malvern Council Offices on the 19th October to celebrate Malvern Appreciation Day. By May 2018 concern was once again increasing about the state of the springs and wells around the Malvern Hills. Each year Well Decorating was a very successful event early in May. In spite of this, deterioration and contamination of springs and water sources caused concern. Animal contamination was often the cause, especially after a dry period followed by rain when contaminated surface water entered the fountains and spouts. Public interest versus the health and safety issues needed a careful balance in dealing with this major unique resource for the Malvern Hills region. Another significant event in 2018 was the securing of planning permission for the building of a Lodge within the Malvern Hills District Council area. This was intended to offer accommodation to overseas visitors coming to Malvern as part of the Malverns Worldwide scheme. Following earlier contact with Malvern House and plantation in Barbados we received a request for a cutting for a George Bernard Shaw Mulberry Tree for planting. We were delighted to arrange for three cuttings from the Malvern, Melbourne tree to be duly delivered for rearing on the Caribbean Island. As part of the Malverns Worldwide project, in 2018 contact was made with Malverns along the historic Lincoln Highway in the United States. Malvern Iowa has since become an enthusiastic active member of the project. Mulberry Pie was also on the agenda and a recipe from Malvern Iowa resulted in pie parties in England to try out variations of the recipe. Early in March 2019, extensive building proposals and development around the Malvern Hills resulted in concern for the long term environmental impact on the Malvern Hills. In conjunction with High Street Malvern, a proposal was formulated and published to establish the region at large as a National Park. Bruce's experience in the 1990s at the University of Sussex with investigating the implications of the possible South Downs National Park was invaluable in developing a proposal. By promoting the concept of national park status it was seen as a way of resolving many issues of major concern relating to the conservation of the wider region around the Malvern Hills. The bi-monthly Friends Newsletter was by now up to number 80 and proved a superb means of communicating with everyone with an interest in Malverns and as a result gauging reactions to such a proposal as a Malvern Hills National Park. March 2019 also saw the formal planting of the George Bernard Shaw Mulberry Tree at Malvern Great House Barbados. 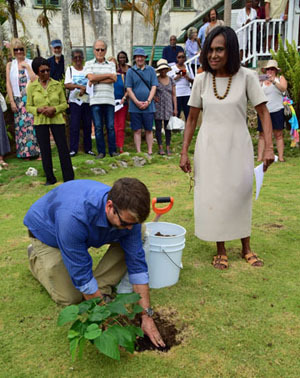 In the picture June Cheesman who owns the house assists the Director of Barbados National Trust to formally plant the tree during an open day attended by over 300 visitors. Six formal proclamations and declarations were received from Malverns elsewhere congratulating June on the planting.